February 14, 2010 Dan O. Say what you will about Roman Polanski, but he can make great films. 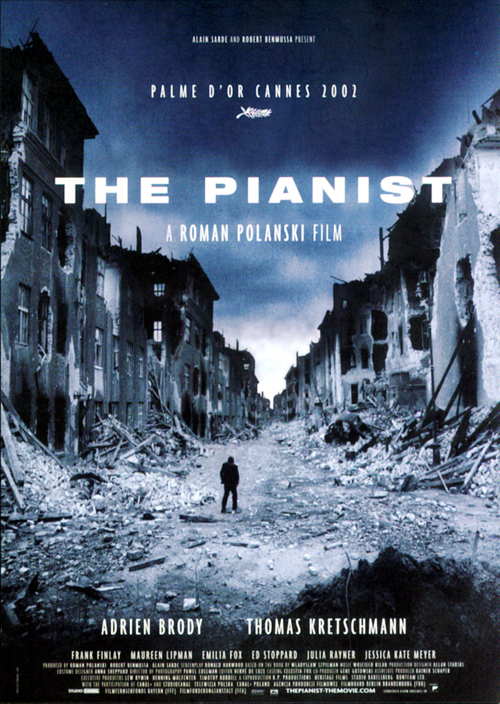 Famed Polish concert pianist Wladyslaw Szpilman (Adrien Brody) struggles to survive the onslaught of Nazi tyranny during World War II in this Roman Polanski-directed drama based on Szpilman’s memoirs. In spite of his well-known musical talents, Szpilman spends several years holed up in Warsaw, barely alive and subsisting on scraps, until grace comes in the form of a second chance — at music, at freedom and at life. Polanski, yes he is a dirty man that has had so many hard troubles in his life. First he survived the Holocaust which is hard as hell, and his wife and baby were killed by The Manson Murderers. But the one thing I will say is that here with The Pianist he makes some of the finest piece of work I have seen in a very long time. The film is a Holocaust film but it isn’t as preachy and obvious as you would expect. Almsot everything is shot from Brody’s point of view, including some great over-head shots of war, and it doesn’t take place in a gritty camp. The message isn’t so much about how bad the Germans were towards the Jews, we already understand that, no it was more about the luck and chances this man took for survival. This film is very very very disturbing with all its blood and violence, but the way its filmed is such a beautiful way. Polanski doesn’t just show dead bodies on the ground over and over again so it catches your attention, instead he just shows these dead bodies and the characters themselves just push it off like nothing, and soon we feel the same effect as they did. There are just so many disturbing and utterly violent scenes that will leave you thinking more about how Jews were treated. The only bad thing about this film is that since it is a Holocaust film, it is a huge downer. I mean if you want to feel depressed well then be my guest and watch this, but there are just plenty of moments in the film that are so bleak you actually start to have the same effect the characters are going through. Adrien Brody really does give a knock-out performance here, now I can see why he won the Oscar. Before the Holocaust and everything before this was happening you can see how all of his emotions and mind change as all this terrible stuff is happening. By the end, Bordy does really well with just looking so bad and dirty, also with his physical performance as looking so injured and weak he can barely move. Consensus: One of Polanski’s most personal films, with a wonderful performance from Brody, highly disturbing content that will leave you scarred, and beautiful scenes mixed with a different approach to the Holocaust film, even if it is a downer. Thanks man, it truly is one of the most memorable Holocaust films of all-time.